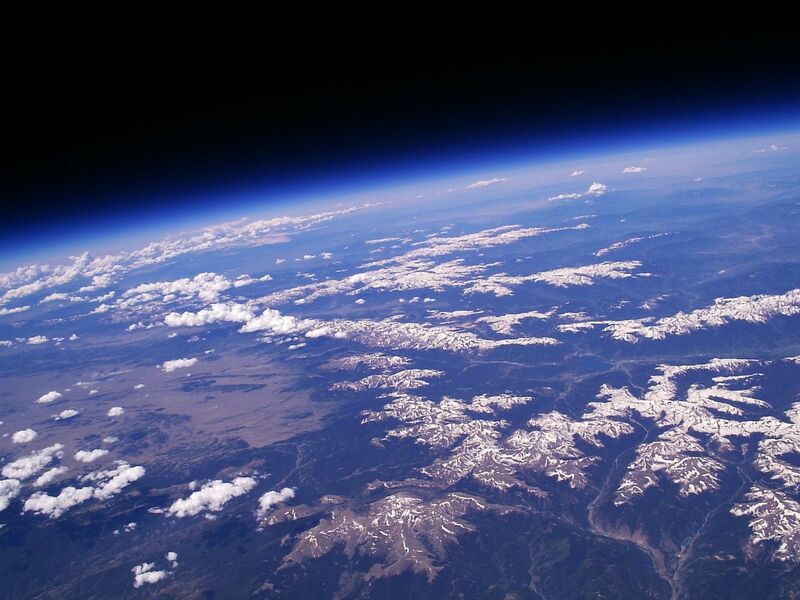 Colorado panorama by balloon, photo credit: Patrick Cullis (patrick.cullis@noaa.gov). The yellow areas are aspen leaves changing color. Boulder, CO is visible on the right, and Colorado Springs is on the left. 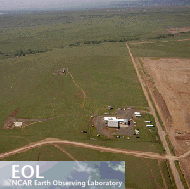 Since 1980, the water vapor research team of the Ozone and Water Vapor group at NOAA/ESRL/GMD in Boulder, Colorado, has made in situ measurements of atmospheric water vapor mixing ratios (mole fractions) from the lower free troposphere (~2 km) up to the middle stratosphere (~28 km) with small, lightweight, balloon-borne NOAA frost point hygrometers (FPHs). These hygrometers, built and calibrated in our laboratory in Boulder are currently flown monthly from Boulder, Hilo, Hawaii, and Lauder, New Zealand. In addition, we have conducted several short-term intensive water vapor measurement programs in Antarctica, the Arctic, China and several tropical locations, often in support of aircraft-based scientific campaigns. 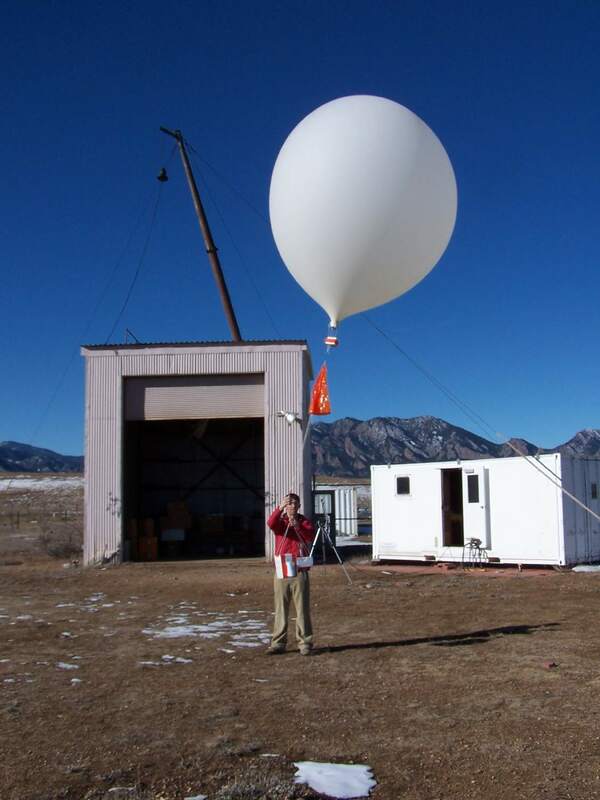 Our balloon payloads normally include an FPH, an electrochemical concentration cell (ECC) ozonesonde and at least one radiosonde to measure temperature, pressure and payload location (via GPS). Why Is Upper Atmospheric Water Vapor So Important? Our primary research focus is the long-term monitoring of upper tropospheric and lower stratospheric (UTLS) water vapor and the processes that control its abundance. Water vapor is a natural and very important component of the Earth’s atmosphere. Its distribution influences many physical and chemical properties of the atmosphere, including weather, clouds, precipitation, radiation balance, convective uplift, lightning generation, and ozone chemistry including the Antarctic ozone hole. Most relevant to our study is water vapor’s effects on the Earth’s energy budget, influencing both the incoming solar radiation and outgoing heat (IR). Variations in the amounts of water vapor in the atmosphere are natural and normal, but changes in its vertical distribution, especially in the upper troposphere and lower stratosphere, may be indicative of changes in the Earth’s climate. For this reason there is great interest in long-term measurement records of water vapor vertical distributions in the UTLS as they may reveal changes in atmospheric dynamics resulting from climate change. The NOAA Frost Point Hygrometer (FPH) has evolved from an analog unit with strip chart recording of data to a digitally controlled instrument with full downlink telemetry of data to a recording computer on the ground. Read more on Basic Descriptions of the hygrometer, the Technique of frost point hygrometry, where and how we launch instrumented balloons, and how we collect the flight data. Stratospheric water vapor mixing ratios measured by the balloon-borne NOAA Frost Point Hygrometer (FPH) over Boulder, Colorado. Data are averaged in 2-km altitude bins. The long-term net increase through 2013 is approximately 20%. Plot created by Dale Hurst (dale.hurst@noaa.gov). 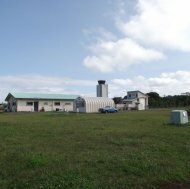 Currently we launch balloon-borne FPHs once per month at Boulder, Colorado, Hilo, Hawaii, and Lauder New Zealand. Click on the photos for site information, water vapor profile plots and access to water vapor data files. Occasionally we add an automated digital camera to our balloon payloads. Photos are taken at frequent intervals up to altitudes of 100,000 ft (30 km). See our Photo Gallery for pictures of the snow-capped Rockies, the blackness of space, and the curvature of the Earth. Hall, E. G., Jordan, A. F., Hurst, D. F., Oltmans, S. J., Vömel, H., Kühnreich, B., and Ebert, V.: Advancements, measurement uncertainties, and recent comparisons of the NOAA frost point hygrometer, Atmos. Meas. Tech., 9, 4295-4310, https://doi.org/10.5194/amt-9-4295-2016, 2016. 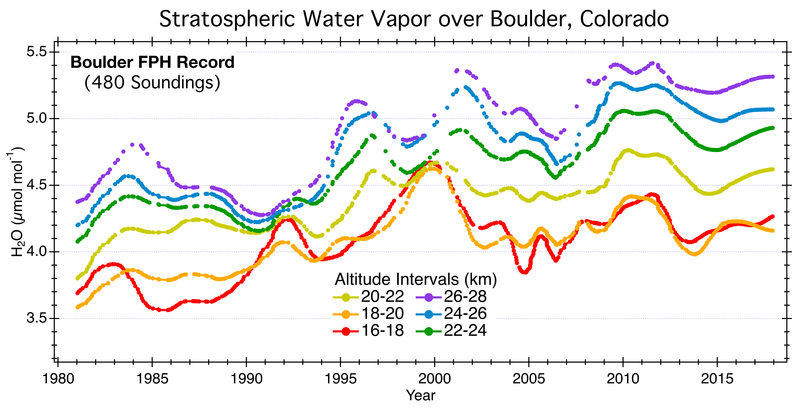 Hurst, D. F., Oltmans, S. J., Vömel, H., Rosenlof, K. H., Davis, S. M., Ray, E. A., Hall, E. G., and Jordan, A. F.: Stratospheric water vapor trends over Boulder, Colorado: Analysis of the 30 year Boulder record, J. Geophys. Res., 116, D02306, doi:10.1029/2010JD015065, 2011a. Hurst, D. F., Hall, E. G., Jordan, A. F., Miloshevich, L. M., Whiteman, D. N., Leblanc, T., Walsh, D., Vömel, H., and Oltmans, S. J.: Comparisons of temperature, pressure and humidity measurements by balloon-borne radiosondes and frost point hygrometers during MOHAVE-2009, Atmos. Meas. Tech., 4, 2777-2793, doi:10.5194/amt-4-2777-2011, 2011b. Hurst, D. F., Lambert, A., Read, W. G., Davis, S. M., Rosenlof, K. H., Hall, E. G., Jordan, A. F., Oltmans, S. J.: Validation of Aura Microwave Limb Sounder stratospheric water vapor measurement by the NOAA frost point hygrometer, J. Geophys. Res. Atmos., 119, 1612-1625, doi:10.1002/2013JD020757, 2014. Hurst, D. F., Read, W. G., Vömel, H., Selkirk, H. B., Rosenlof, K. H., Davis, S. M., Hall, E. G., Jordan, A. F., and Oltmans, S. J.: Recent divergences in stratospheric water vapor measurements by frost point hygrometers and the Aura Microwave Limb Sounder, Atmos. Meas. Tech., 9, 4447-4457, https://doi.org/10.5194/amt-9-4447-2016, 2016. Kley, D., Russell III, J. M., and Philips, C.: SPARC Assessment of Upper Tropospheric and Stratospheric Water Vapour, World Meteorol. Org., Geneva, 2000. Mastenbrook, H. J., and Dinger, J. E.: Distribution of Water Vapor in the Stratosphere, J. Geophys. Res., 66, 1437-1444, 1961. Mastenbrook, H. J.: A control system for ascent-descent soundings of the atmosphere, J. Applied Meteorology, 5, 737-740, 1966. Mastenbrook, H. J.: Water Vapor Distribution in the Stratosphere and High Troposphere, J. of Atmospheric Sciences, 25, 299-311, 1968. Mastenbrook, H. J.: Operation Manual for Model 1012 Hygrometer, Naval Research Laboratory Instruction Book, 176, 1981. Mastenbrook, H. J., and Oltmans, S. J.: Stratospheric water vapor variability for Washington, DC/Boulder, CO: 1964–82, J. Atmos. Sci., 40, 2157–2165, 1983. Oltmans, S. J.: Measurements of water vapor in the stratosphere with a frost-point hygrometer, Moisture and Humidity-1985-Measurement and Control in Science and Industry, 251-258, 1985. 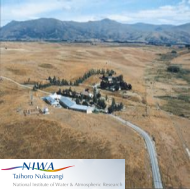 Oltmans, S. J., and Hofmann, D. J.: Increase in lower-stratospheric water vapour at a mid-latitude northern hemisphere site from 1981 to 1994, Nature, 374, 146–149, doi:10.1038/374146a0, 1995. Oltmans, S. J., Vömel, H., Hofmann, D. J., Rosenlof, K. H., and Kley, D.: The increase in stratospheric water vapor from balloonborne, frostpoint hygrometer measurements at Washington, D.C., and Boulder, Colorado, Geophys. Res. Lett., 27(21), 3453–3456, doi:10.1029/2000GL012133, 2000. Rollins, A. W., Thornberry, T. D., Gao, R. S., Smith, J. B., Sayres, D. S., Sargent, M. R., Schiller, C., Krämer, M., Spelten, N., Hurst, D. F., Jordan, A. F., Hall, E. G., Vömel, H., Diskin, G. S., Podolske, J. R., Christensen, L. E., Rosenlof, K. H., Jensen, E. J., Fahey, D. W.: Evaluation of UT/LS hygrometer accuracy by intercomparison during the NASA MACPEX mission, J. Geophys. Res. Atmos., 119, 1915–1935, doi:10.1002/2013JD020817, 2014. Rosenlof, K. H., and Reid, G. C.: Trends in the temperature and water vapor content of the tropical lower stratosphere: Sea surface connection, J. Geophys. Res., 113, D06107, doi:10.1029/2007JD009109, 2008. Scherer, M., Vömel, H., Fueglistaler, S., Oltmans, S. J., and Staehelin, J.: Trends and variability of midlatitude stratospheric water vapour deduced from the re‐evaluated Boulder balloon series and HALOE, Atmos. Chem. Phys., 8, 1391–1402, doi:10.5194/acp-8-1391-2008, 2008. Solomon, S., Rosenlof, K. H., Portmann, R. W., Daniel, J. S., Davis, S. M., Sanford, T. J., and Plattner, G.-K.: Contributions of stratospheric water vapor to decadal changes in the rate of global warming, Science, 327, 1219–1223, doi:10.1126/science.1182488, 2010. Vömel, H., Oltmans, S. J., Hofmann, D. J., Deshler, T., and Rosen, J. M.: The evolution of the dehydration in the Antarctic stratospheric vortex, J. Geophys. Res., 100, 13,919–13,926, 1995. Vömel, H., David, D. E., and Smith, K.: Accuracy of tropospheric and stratospheric water vapor measurements by the cryogenic frost point hygrometer: Instrumental details and observations, J. Geophys. Res., 112, 8305, doi:10.1029/2006JD007224, 2007a. Vömel, H., Yushkov, V., Khaykin, S., Korshunov, L., Kyro, E., and Kivi, R.: Intercomparison of stratospheric water vapor sensors: FLASH-b and NOAA/CMDL frost point hygrometer, J. Atmos. Ocean. Tech., 27, 941–952, doi:10.1175/JTECH2007.1, 2007b. Vömel, H., Barnes, J. E., Forno, R. N., Fujiwara, M., Hasebe, F., Iwasaki, S., Kivi, R., Komala, N., Kyrö, E., Leblanc, T., Morel, B., Ogino, S.-Y., Read, W. G., Ryan, S. C., Saraspriya, S., Selkirk, H., Shiotani, M., Valverde Canossa, J., Whiteman, D. N.: Validation of Aura Microwave Limb Sounder water vapor by balloon-borne Cryogenic Frost point Hygrometer measurements, J. Geophys. Res., 112, D24S37, doi:10.1029/2007JD008698, 2007c.